Sauerkraut: Where to Buy Raw Versions. 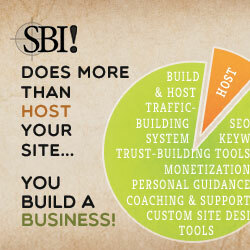 Try This Source. Making raw sauerkraut yourself is your most money-saving option and I have recipes for it and other fermented foods in my book, Probiotics: How to Use Them to Your Advantage. If you don't want to make it, or want to try some new varieties, there are reputable sources online or in natural health food stores. Look for raw, organic kraut and other cultured vegetables. Learn more about why you would want to eat sauerkraut here. Before I started making my own krauts and cultured vegetables, I really liked Immunitrition's cultured vegetables. I would keep jars on hand, even when I made my own, to have for when I was too busy to make it. Unfortunately, as of mid-December 2015, Immunitrition had to suddenly re-locate due to a building-leasing issue. It will take quite a while to move their facility and receive the proper inspections and permits to resume their operation. Please be sure to check ingredients before purchasing and refrigerate upon arrival! 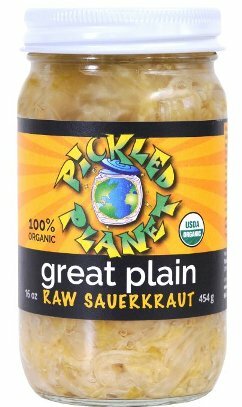 Their Great Plain Raw Sauerkraut has 4.8 stars from 23 people as of December, 2015. It contains organic cabbage and Himalayan salt. 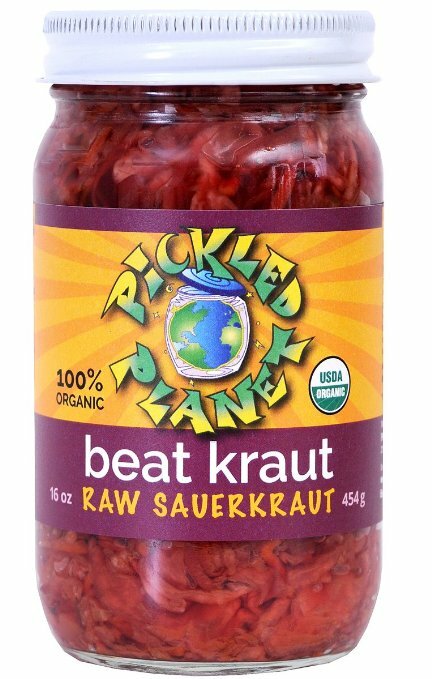 Their Beat Kraut Raw Sauerkraut has 4.3 stars from 7 people as of December, 2015, and contains organic cabbage, organic carrots, organic beets, sea salt and caraway seeds. 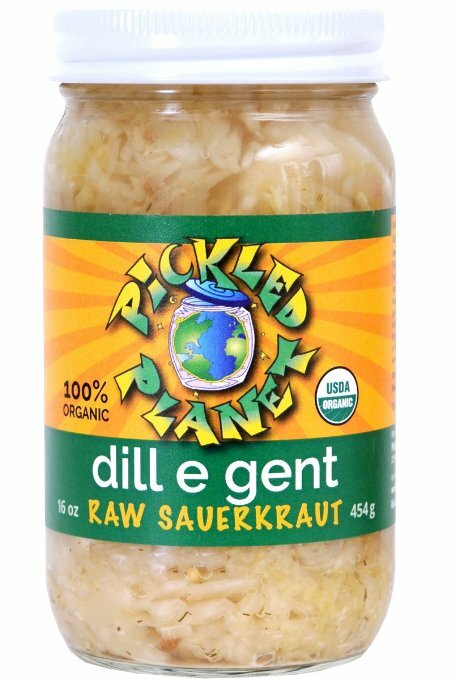 Their Dill E Gent Raw Sauerkraut has 4.7 stars from 4 people as of December, 2015, and contains organic cabbage, organic garlic powder, sea salt and organic spices. 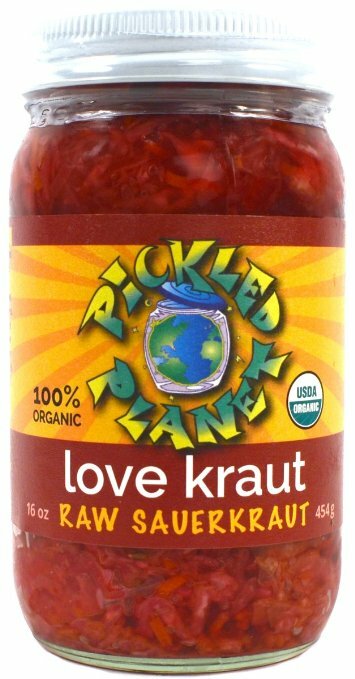 Their Love Kraut Raw Sauerkraut made with organic cabbage, organic carrots, organic burdock, Himalayan salt, organic garlic, cumin and organic coriander. It has 4 stars from 1 review as of December, 2015. 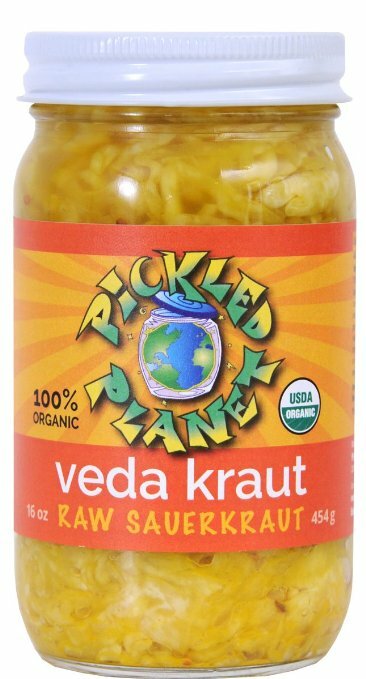 Their Veda Kraut Raw Sauerkraut is made with cabbage and curry spices without garlic, onion or hot peppers. 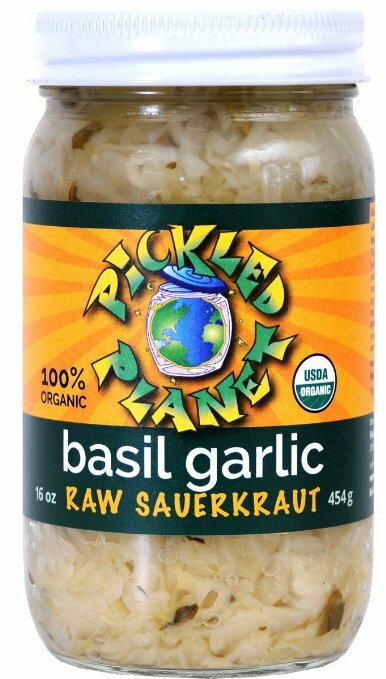 Their Basil Garlic Raw Sauerkraut is made with organic cabbage, organic garlic, organic basil and Himalayan Salt. 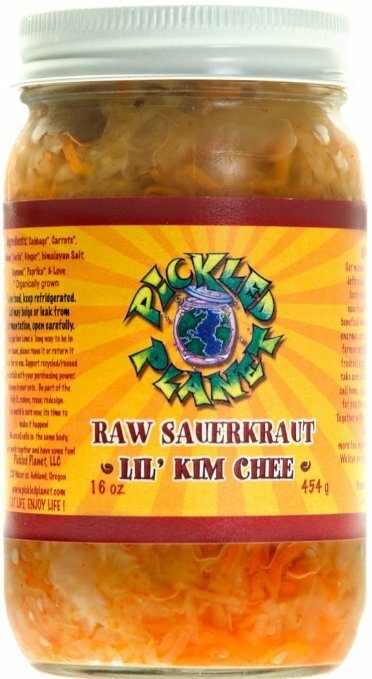 Their Lil Kim Chee is made with organic cabbage, organic carrots, organic daikon, organic garlic, organic ginger, Himalayan salt, organic cayenne and organic paprika. 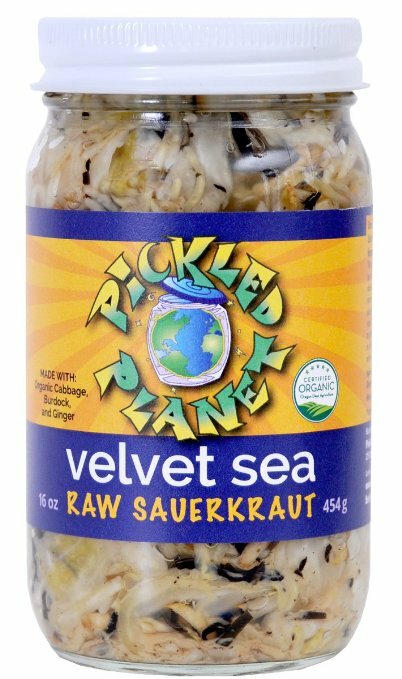 Their Velvet Sea Raw Sauerkraut is made with organic cabbage, organic burdock, organic ginger, arame, hijiki and Himalayan salt. 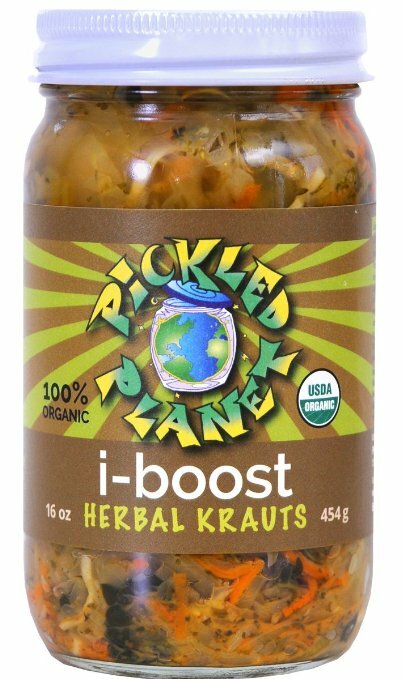 Their I-Boost Herbal Krauts is made with organic cabbage, organic carrots, organic burdock, organic horseradish, organic garlic, organic kale, organic nettle leaf, organic ginger, organic lemon, Himalayan salt, organic thyme, organic oregano and cayenne pepper. Return to page about other cultured foods and drinks.